Many of us who gathered in Pordenone this October for its annual festival of silent films, Le Giornate del Cinema Muto, arrived with nervous questions about whether the newly rebuilt Teatro Verdi would be ready for us and whether it would be up to the challenge of hosting a packed program of movies in various formats, all with live musical accompaniments. Three years ago we had been promised a new theatre only to be disappointed at the last minute. But this year, the Giornate’s 26th, we discovered that the Verdi was ready, and the new theatre proved to be more than up to the festival’s stringent requirements. After eight years of daily 45-minute commutes back and forth from Pordenone hotels to the small town of Sacile, which hosted the festival while the Verdi was being rebuilt, we found we could stroll back and forth between movies, hostelries, and the seemingly infinite assortment of Pordenone restaurants. The suspense generated by the uncertainty over the festival theatre made me more alert than usual to the suspense aroused by the movies themselves. Pordenone’s program, a particularly strong one this year, offered a wealth of opportunities to experience the pleasure of anticipating what came next and to contemplate the arsenal of techniques available even in the pre-sound era for creating narrative tension. From script construction to acting to mise en scène to editing to music, early films had ample means for keeping audiences on the edge of their seats. A handsomely mounted updating of Thomas Mann’s novel Buddenbrooks originally released in 1923 was also featured as part of the Giornate’s Weimar program. The plot pulls a single episode from Mann’s sprawling epic to focus on the vicissitudes of Thomas, the Buddenbrook’s family patriarch (Peter Esser). Thomas’s loyalty to his relatives leads him to entrust important business dealings to an incompetent brother. In order to clean up the resulting calamity, Thomas must meet a deadline to repay a loan. Director Gerhard Lamprecht heightens the suspense surrounding Thomas’s desperate visits to friends and colleagues by intercutting these episodes with scenes in which the beleaguered capitalist’s neglected wife Gerda (Mady Christinas) makes up her mind to leave him. 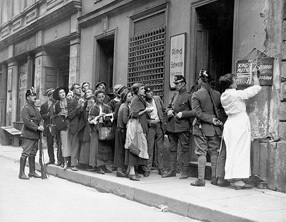 The best received of the lesser-known Weimar era productions shown in Pordenone was not properly a part of Robinson’s series but rather a 1929 film screened to preview a retrospective of cinematic adaptations of works by Heinrich Schnitzler, which was to be mounted later in Pordenone, Udine and Trieste. Written, produced and directed by Paul Czinner, Fräulein Else, based on a Schnitzler novella, tells a simple tale about an innocent young girl (played by Elisabeth Bergner, Czinner’s wife) who is pressured into selling herself to save her father’s reputation. How will Else react when confronted with the necessity of engaging in an act which is, for her, unthinkable? Here Bergner’s skillful turn as the title character carries the suspense. First, as Else tries to approach the man who can save her father from financial ruin, long shots document the young girl’s fastidious timidity, signaled by the irresolute, indecisive movements of Bergner’s lithe body. Subsequently, when her father’s potential patron names the shameful price Else must pay for his largesse, the camera captures Bergner’s anguished reactions in extended close-ups as she contemplates her options. 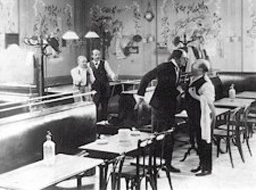 The Weimar series culminated in a screening of G. W. Pabst’s 1929 Pandora’s Box (Die Büchse der Pandora, a.k.a. Lulu), the closing night presentation. Though most of those in the audience were familiar with this classic title, few of us had ever had the opportunity to see a good print on the big screen. (3) Pandora’s Box relies less on developing narrative suspense than on underlining the sensational events featured in the many showy set pieces Pabst reproduced from Frank Wedekind’s pair of ground-breaking plays. Wedekind had conjured up an archetypal femme fatale in Lulu, the sexually transgressive heroine of the tale, who is indelibly embodied in Pabst’s film by the incandescent, insouciant Louise Brooks. The Giornate screening featured a new musical score by Paul Lewis, whose flamboyant composition was perfectly suited to the expressionistic excesses of the film’s story and mise en scène. Lewis himself was in attendance, conducting the Sinfonica del Fruili Venizia Guilia to accompany the performance. A more subdued, sentimental melodramatic mode was on display in the D.W. Griffith films featured in the Pordenone program. 2007 was the penultimate year of the Giornate’s multi-year Griffith retrospective, which is committed to screening all of the extant works of the so-called “father of film” in chronological order. This year we saw Griffith’s productions from the early 1920s. The week began with a gala screening of Orphans of the Storm, which also featured music by the Sinfonica. Showings of less familiar titles like America and Isn’t Life Wonderful? (both released in 1924) rounded out the series. Taken as a whole, the program exploded the myth that the great innovator’s command of his medium declined during the flapper era. In particular, the gripping climaxes which concluded most of these films showed off inventive variants on Griffith’s trademark crosscutting to build suspense. For many of us, the highlight of the Griffith series was The White Rose. Originally released in 1923, The White Rose follows the downward spiral of a naïve young orphan who becomes the sexual victim of a wayward minister. The story drew on a host of Victorian-era models from Charlotte Temple to The Scarlet Letter to Griffith’s own Way Down East. But Griffith recast his material in a fresh way in this modestly scaled tearjerker and was blessed by a knockout performance from his leading lady Mae Marsh as Teazie, the story’s heroine. Marsh’s pale blue eyes seem almost translucent on screen creating an all-too-permeable membrane between the raw emotional need Teazie feels and the callow modern world in which she finds herself. 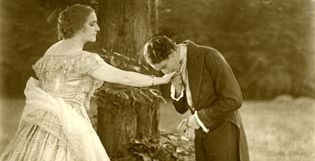 The parallel montage that climaxes the film features Teazie struggling through a storm with her illegitimate baby as Joseph, her erstwhile lover (Ivor Novello), woos rich girl Mary (Carol Dempster) in the latter’s luxurious mansion. Clichèd though it may be, the sequence conveyed a potent emotional force, especially in a shot featuring Teazie as she stops outside Mary’s window and sees her privileged rival inside. Joseph, who stands beside Mary, remains just out of frame in this deep space composition. Many of us in the Pordenone audience left the screening of The White Rose scratching our heads over what appeared to be a double ending. Tom Gunning’s erudite and insightful commentary on the film in the Griffith Project book series rationalises the dual ending in symbolic terms, (4) but nonetheless I couldn’t help imagining disastrous previews before the production’s initial release and Griffith’s subsequent scramble to tack a conventional Hollywood ending onto a story he had originally envisioned as a tragedy. One other melodrama shown in Pordenone should be noted, this one part of the “Out of Frame” section of the fest, a standing category which allows the Giornate programmers to include newly restored films and other productions of particular interest that don’t fall within the designated themes in the line-up for any given year. The 2007 “Out of Frame” selections included The First Born, a 1928 British production directed by actor Miles Mander, well known to audiences of the day as the quintessential upper class cad. Mander typecast himself as a coldhearted aristocrat in The First Born, with Madeleine Carroll as his long-suffering wife, who fakes pregnancy to keep his interest. Though Mander the director fails to curb Mander the actor from mugging shamelessly in a number of scenes, he manages the rest of the cast and the other elements of the production with aplomb. The well-made script, which Mander co-wrote with Alma Reville, features a beautifully wrought final twist that capitalises on the visual language of silent cinema. After viewing The First Born, many people at Pordenone began speculating not just about the aborted directorial career of Mander, who never again made a film of this quality, but also about the contributions made to the production by Reville, previously known to most of us only as Mrs Alfred Hitchcock. The 2007 Giornate program included a number of exceptional comedies alongside its menu of melodramas. One of the most delightful of these was Pass the Gravy, a festival legend ever since it was first shown there in 1994. 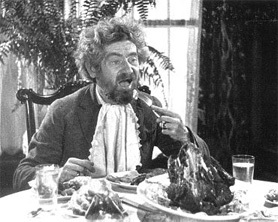 Robert Farr has justly ranked this 1928 Max Davidson short as “a masterpiece that stands with the best comedy work of the silent era.” (5) One of the film’s many triumphs is the way in which it builds suspense around a family dinner in which the guest of honour unknowingly consumes his prize rooster as the main course. In a series of comic shticks the children try to signal the calamitous news to their father, who is the host; punctuating their antics are reaction shots of the movie’s star Max Davidson as the father who takes forever to catch on to the dire situation. The 2007 showing of Pass the Gravy featured a charming musical accompaniment by a kazoo orchestra made up of students from a local middle school; music teacher Maria Luisa Sogaro and fest mainstay Neil Brand oversaw the young people’s performance. Reaction shots also took centre stage in another brilliant comedy on display at Pordenone, the 1927 version of Chicago, putatively directed by Frank Urson but closely overseen by producer Cecil B. DeMille. While all other versions of Maurine Watkins’ rowdy stage satire cast Amos Hart, the wronged husband of the piece, in a subordinate role as a dim-witted gull; screenwriter Lenore Coffee here puts Amos (played by intelligent-looking Victor Varconi) at the emotional centre in this version. With Amos Coffee creates a complex persona with whom we become deeply involved, even though the other characters in the drama are flatly drawn cartoons. During the course of the story Amos’ blind adoration of his wife, the lethal floozy Roxie (Phyllis Haver), is sorely tested. As a result, the film’s belly laughs alternated with moments of suspense centred on the question of how far Amos’s devoted loyalty to his wife would carry him. The empathetic bond set up by the film’s many close-ups of Amos was deepened at the Pordenone screening by the Prima Vista Social Club’s musical accompaniment, which included excerpts from poignant ballads like “Body and Soul”. For me, the most memorable film of the entire 2007 Giornate program was another comedy, Les Deux Timides, screened as part of a retrospective of René Clair’s work from the 1920s. Originally a surrealist dedicated to the deconstruction of narrative, Clair crafted early avant-garde productions like Paris qui dort (1923-25) and Entr’acte (1924) as whimsical collections of images with little in the way of logical connections. “To laugh is to dream,” he once said, “to laugh is to be free.” (6) Clair’s avant-garde works were favourites of many Giornate-goers, but I favoured the two plot-heavy comic films the director made later in the decade from plays by the 19th century farceur Eugène Labiche, Un Chapeau de paille d’Italie (The Italian Straw Hat a.k.a The Horse Ate the Hat, 1927) and Les Deux Timides (1928). Labiche, for his part, was dedicated to the construction of intricate narratives. “A play is a thousand-legged creature which must keep going,” he opined. “If it slows up, the public yawns; if it stops, the public hisses.” (7) The first of Clair’s Labiche adaptations, The Italian Straw Hat, has long been familiar to film scholars, but Les Deux Timides has heretofore been difficult to see and was thus a revelation to most of us. This ingeniously crafted romp centres on two timid men: Frémissin (Pierre Batcheff), a neophyte lawyer who is in love with Cecile (Vera Flory); and Cecile’s father Thibaudier (Maurice de Féraudy). True to its farcical pedigree, the suspense in Les Deux Timides frequently focuses on the discovery of people concealed in closets and behind bedroom doors. The audience also wonders anxiously when and how the bashful hero will be able to summon the courage to ask Thibaudier for his daughter’s hand. In a film filled with exquisitely realised scenes, the opening and closing episodes of Les Deux Timides, which take place in the French law courts, were high points, employing subjectively rendered montages in which images were substituted for dialogue. The droll comedy of Les Deux Timides was further enlivened by Neil Brand’s masterful piano accompaniment, just one of many superb live musical performances we heard throughout the week. It would be remiss in any review of the Pordenone event not to give special notice to its music. Each year, the festival brings pianists skilled in this arcane art form from all over the world, as well as an array of musical groups who come from near and far to perform original and traditional pieces. On more than one occasion, we heard full symphony orchestras. If the new Verdi had a single failing, it was that the depth of the orchestra pit prevented the audience from seeing the musicians. But we applauded each performance just the same. Every year, it seems, the music at this ambitious festival surpasses the high standard set the year before. It’s an aspect of the Giornate that one always eagerly anticipates without experiencing the slightest feeling of suspense about the quality of what will be presented. Siegfried Kracauer, From Caligari to Hitler: A Psychological Study of the German Film, Princeton University Press, Princeton, 1974; Lotte H. Eisner, The Haunted Screen, University of California Press, Berkeley, 1969. Geoff Brown, “Das alte Gesetz (Baruch)”, Le Giornate del Cinema Muto 2007 Program Book, p. 45. The Giornate showed a pristine 35mm print restored in 1998 by the Cineteca di Bologna from a copy in the BFI. As far as I could ascertain, this print does not differ substantively from the Criterion DVD version, which is taken from a print restored in 1997 by the Munich Film Museum. Pabst’s original script, edited and translated by Christopher Holme (Simon and Schuster, New York, 1971) contains several additional scenes, which Holme speculates were part of the film as originally shot. In addition, the Internet Movie Database mentions a 152 minute print with French titles at the Brussels Musée du Cinéma. Tom Gunning, “The White Rose”, The Griffith Project: Volume 10: Films Produced in 1919-46, BFI, London, 2006, pp. 146-58. Robert Farr, Hollywood Mensch: Max Davidson”, Griffithiana, no 55/56, 1996. Quoted in Celia McGurr, René Clair, Twayne, Boston, 1980, preface. Virginia Wright Wexman is Professor Emerita of English and Art History at the University of Illinois at Chicago. Her books include Creating the Couple (Princeton, 1993), A History of Film (6th Edition: Allyn & Bacon, 2006), and the anthology Film and Authorship (Rutgers, 2002). As President of Silver Screen Tours, she leads groups to international film festivals on a regular basis.